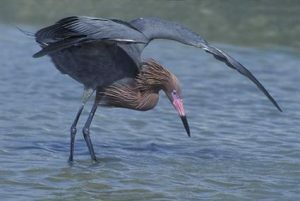 The Reddish Egret is a heron commonly found in Central America and the surrounding places such as the Caribbean Islands, the Bahamas and Mexico. It is one of the most energetic and active of all the herons and constantly likes to be on the move. 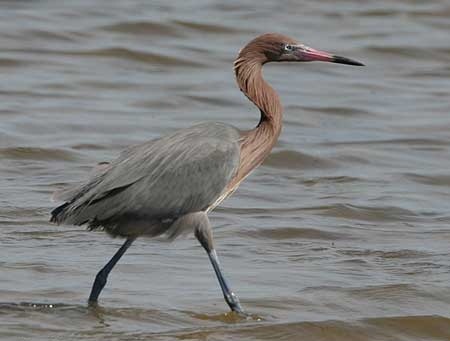 Height: The Reddish Egret is a medium-sized heron that reaches a height of up to 2½ feet. Weight: Average weight of these birds is around 450 grams. Legs: They have long bluish-black legs and feet. Bill: The pinkish bill is long and pointed; it has a black tip. Wingspan: The wingspan of these birds is around 46 to 49 inches. Neck: These birds hold their necks in an S-shape when they are standing in the ground or at flight. 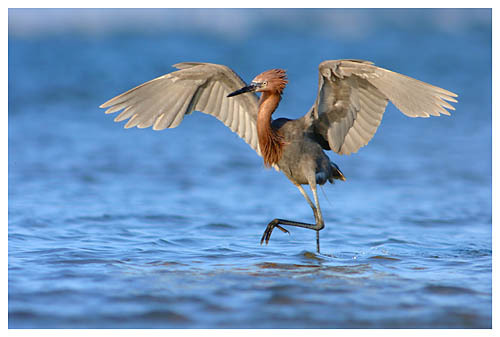 Color: The Reddish Egret has got two color morphs. The adult white morph is completely white in color with slate-grey legs and a pink bill. They are also a bit larger in size than the dark morph. The dark morph, on the other hand, has reddish-brown plumage on the head and neck. In some cases, certain individual birds display mixed traits; i.e. they are mostly a dark morph with some scattered white feathers. The young ones have a grayish-brown colored body, neck and head with a black bill. The breeding adults are characterized by having flowing back plumage on the neck and head that looks like a mane, a purple circle around the eyes and cobalt-colored legs. In general, the crown, forehead, nape and throat are reddish-brown and the lower parts of the body are gray in color. Sexual dimorphism: The two sexes are similar in appearance. 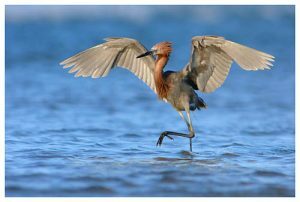 The Reddish Egret is a crepuscular bird; which means that they are active mostly during the dawn and dusk. These birds are in general very active and like to spend most of their time being on the move. While hunting, these birds fly close to the water surface casting a shadow with their wings to reduce light reflections so that they can see their prey. They can easily hunt the fishes down in this reduced light. This results in a fascinating movement that looks like a graceful dance. These birds mostly feed on fishes, frogs, insects and crustaceans. The adults are mostly silent. They however make a guttural croaking sound and low, soft clucking sounds to mark their territory during the breeding months. These birds have a graceful and buoyant flight pattern with steady flapping of wings. They often dash straight ahead in search of preys or fly in circular motion. These birds are commonly found in the coastal beaches of Florida and Texas, in Louisiana and North Carolina, the Gulf Coast of the United States, Caribbean Islands, the Bahamas and Mexico. It is also a resident of places like Cuba, Belize, Dominican Republic, Venezuela and Colombia. After breeding, some individuals migrate towards the north from their nesting zone. These birds like to hang out in areas having brackish or salty water like lagoons, salt marshes, coastal tidal flats, open marine flats. They can also be seen in areas with large populations of black mangrove and red mangrove tees. The adults of this species are not regularly preyed upon due to their physical size and ability to escape. However, the eggs and small ones are consumed by alligators, raccoons, vultures and other birds of prey. These birds are equipped with long legs that enable them to run fast and evade the grasp of their predators. Reddish egrets can fly at a good speed; this ability also acts as a defense mechanism against preying species. They have strong vision which helps them to spot predators as well as a food source from a long distance. Their long legs enable them to stand on water without disturbing the nearby fishes. This helps them to catch the fishes easily. Reddish egrets build their breeding nests typically in red mangrove forests, in the ground or in tropical swamps. The nests are usually platforms made of sticks or twigs in shrubs or trees. These birds like to nest in groups or colonies frequently with other herons. 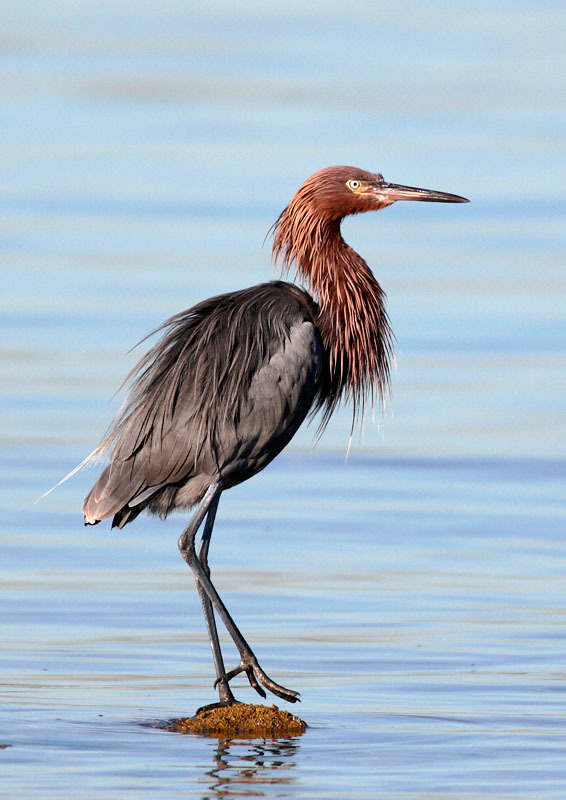 The colonies of Reddish Egrets usually reside on coastal islands. The courtship displays of Reddish egrets are very loud and noisy. The greeting ceremony involves shaking and nodding of the head which is followed by chasing and flying around in circles. These birds also raise the feathers in their body and clack their bills together. The female lays around 2 to 5 blue-green eggs. Both the parents incubate the eggs for around 26 days. The chicks learn to fly when they are around 45 days old. They generally leave the nest at the age of 9 weeks. Both the parents take an active part in rearing the young. The average lifespan of these birds is around 12 years. These birds are classified under the category of “Near Threatened” by the IUCN. The number of surviving nesting pairs in USA lies between 1500 and 2000, most of which can be found in Texas. Hence these birds are now kept under special protection. A group of egrets is known by many names, such as “heronry”, “congregation”, “RSVP”, “wedge” and “skewer” of egrets. They have a unique method of hunting in which they use their wings to reduce glare from water surface and spot their prey more accurately. This type of hunting mechanism is known as ‘canopy feeding’. These birds are sometimes confused with certain other similar species, namely the Great Egret, the Snowy Egret and the Cattle Egret. These birds were once hunted exclusively for their plumage. They have a habit of regurgitating their food once they have eaten. This method is used by the parents while feeding the young chicks as well. Here are some images of these beautiful birds. The Reddish Egret is one of the most colorful and interesting of all heron species. Unfortunately, their numbers have been reduced greatly due to habitat destruction and plumage trade. It is thus important to preserve these birds as they make an essential part of the American ecological heritage. # There is considerable amount of dispute regarding which order they belong to: according to some sources, it is “Pelecaniformes”, while in some other sources it is “Ciconiiformes”.